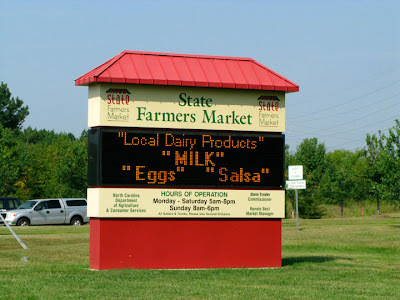 The “Blog” of “Unnecessary” Quotation Marks: mmm "salsa"
Lincoln spotted this one, which leads me to believe that "salsa" is some kind of "dairy product". "Why don't we all use 'quotes' all the time?" Instead, it's chunks of cheese, butter, sour cream, and a sprinkling of whey powder. Apparently eggs also come from cows. Who knew? Clearly all these terms are euphemisms for illegal products or services. As in, "I'm going down to the 'market' for some 'dairy products.'" Women should make sure their husbands steer clear of this establishment. Well, it is a huge farmers market. Multiple areas, lots of good hiding spots... who knows what you are going to find there! I love that there are no words on that sign that AREN'T in quotations! What? Where does that come from? hum...salsa a dairy product? I wonder if anyone noticed this sign when they were there?